This post is sponsored by Fleischmann’s® Simply Homemade®. All opinions are my own. 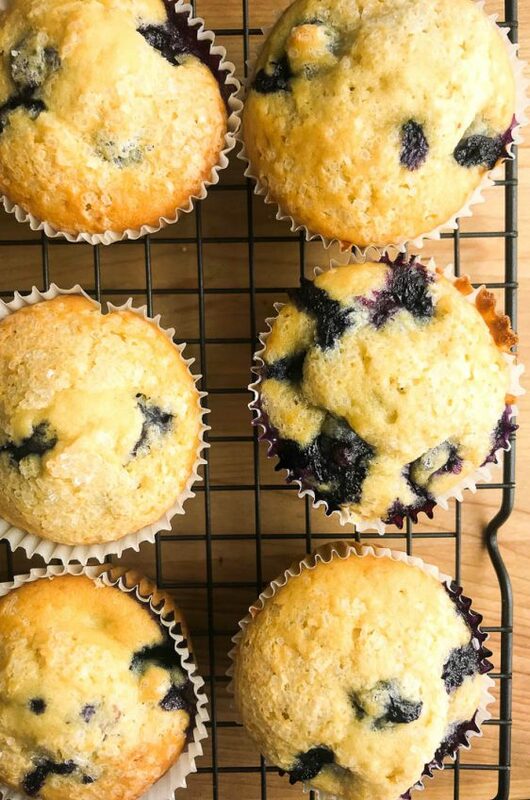 Muffins are always a great thing to have around the house. They are perfect for quick breakfasts and afternoon snacks. 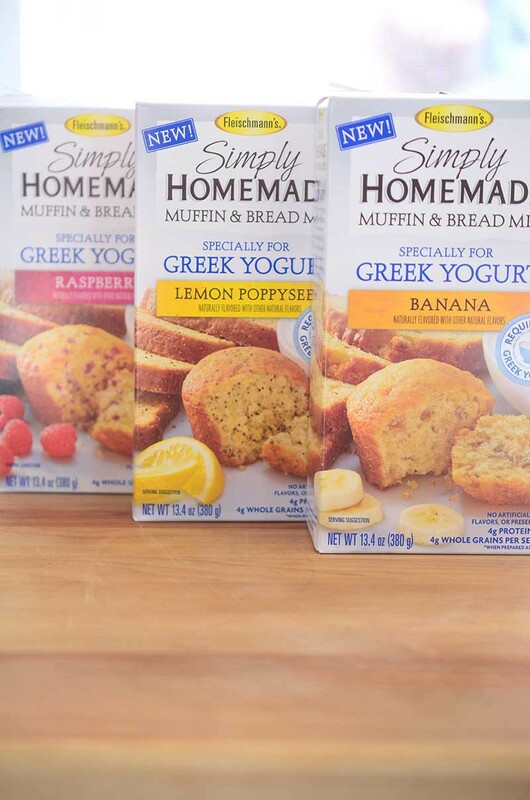 And now, thanks to Fleischmann’s® Simply Homemade® Muffin and Bread Mix made specially for Greek yogurt, they also pack a boost of protein and whole grains. 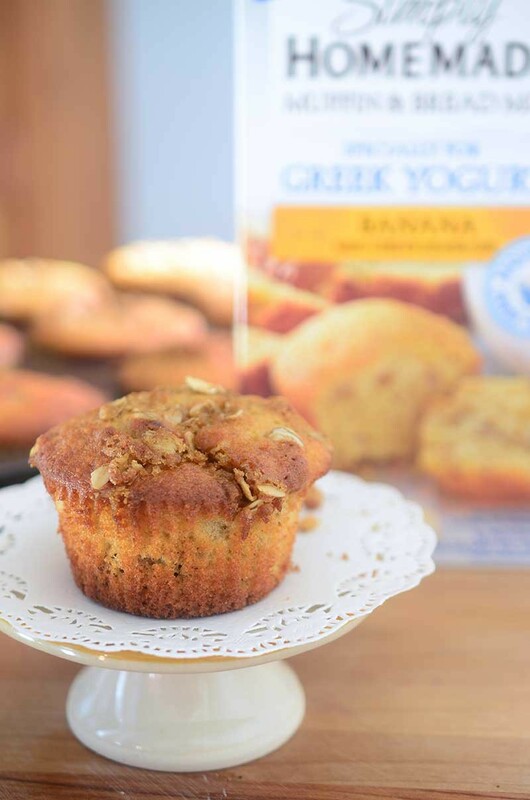 I used their new banana mix to make these Chocolate Chip Banana Oat Muffins, and the family gobbled them up. 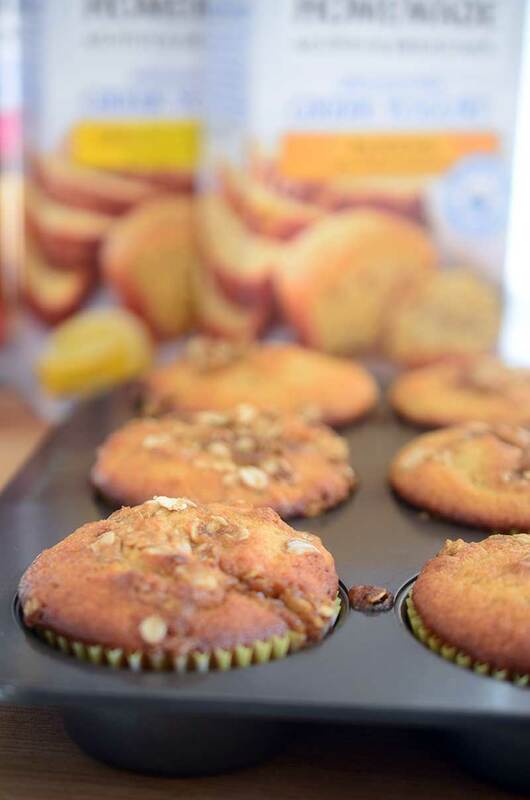 When the nice people at Fleischmann’s Simply Homemade contacted me and asked me to check out their new line of baking mixes, I was pretty intrigued. I do a lot of cooking with Greek yogurt and always have it in the fridge. I love swapping it out for mayonnaise in dips and dressings because of the added protein and was so excited to see a new baking product that I could use it in. The mixes come in three different flavors: raspberry, lemon poppyseed and banana. 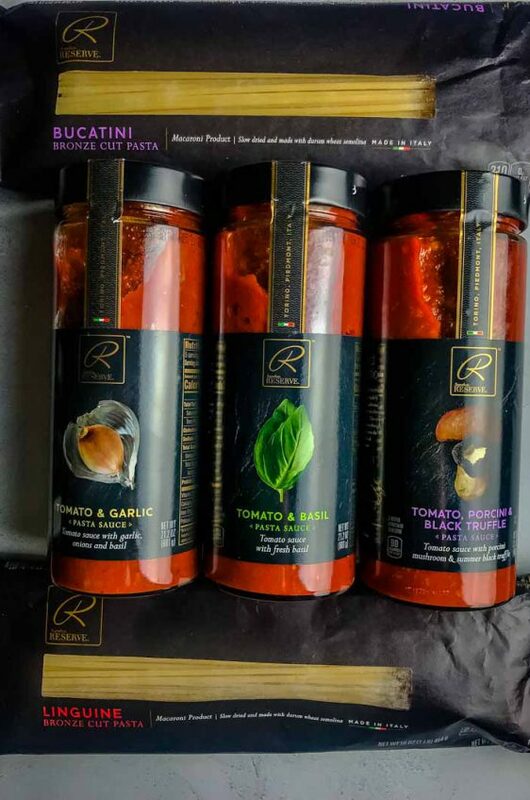 They are made with simple ingredients like real fruit and juices and don’t contain any artificial colors, flavors or preservatives. And they are super easy to make. For this recipe, I decided to use the banana mix. I chose this flavor because banana bread and muffins are always a huge hit in our house. I generally make them from scratch, so I was curious how a mix would go over. I kind of thought that, like some other mixes I have tried, the muffins would come out to be dry and less flavorful. 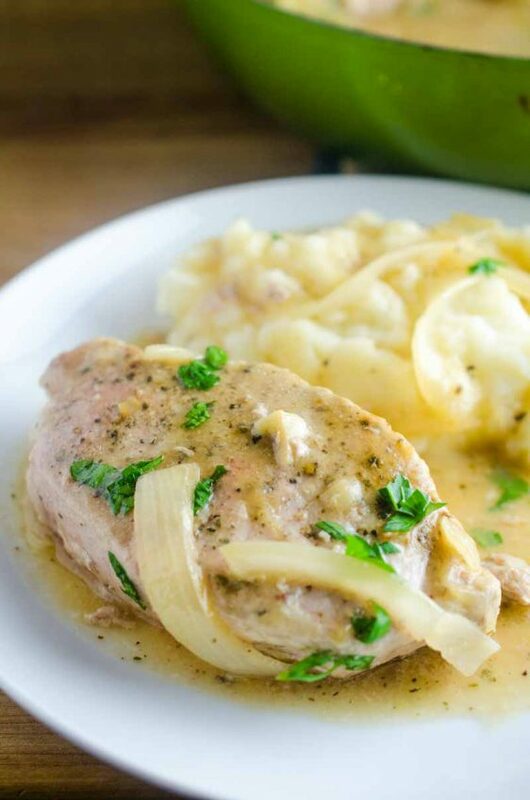 They came out just right – moist and oh so delicious. I used a single serve vanilla Greek yogurt, because I wanted the extra vanilla flavor, but you can also use 2/3 cup of plain yogurt. The product also lends itself to all kinds of mix-ins. You could easily toss in nuts or dried fruits. I chose to use chocolate chips, because really, chocolate and banana is one of my all time favorite combinations. 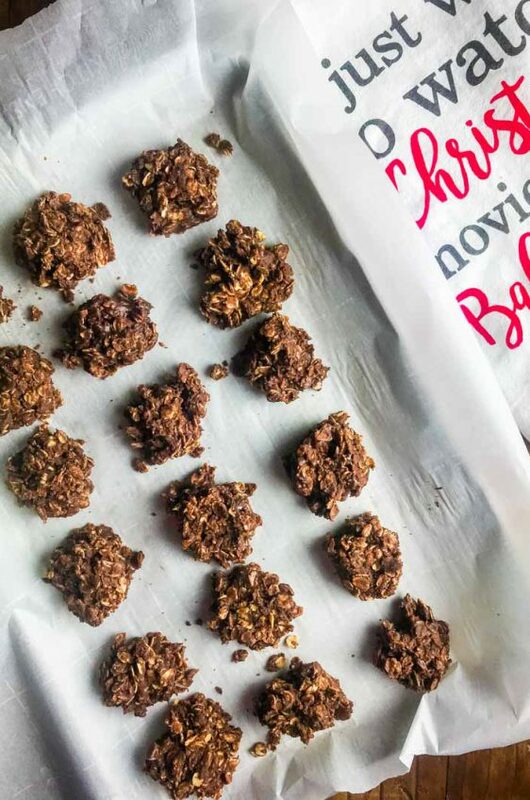 The whole family loved these Chocolate Chip Banana Oat Muffins. I kid you not. Kellan ate two every morning until they were gone. Growing boys. What am I going to do when they are teenagers?! Line a muffin tin with paper liners or spray with cooking spray. Combine baking mix, Greek yogurt, eggs, oil and water in a bowl. Stir until mixture forms a batter. Fold in chocolate chips. Spoon batter into prepared muffin tin, filling each cup ⅔ of the way full. In a bowl mix oats, brown sugar and butter until well combined. Sprinkle oat mixture on the top of batter. Bake in preheated oven for 15 - 20 minutes or until wooden toothpick inserted comes out clean. Remove from oven, cool completely, then serve. Banana muffins with chocolate chips are a family favorite in our house! Can’t wait to try these baking mixes! I had no idea they had come out with baking mixes! I’m obsessed with this new discovery. 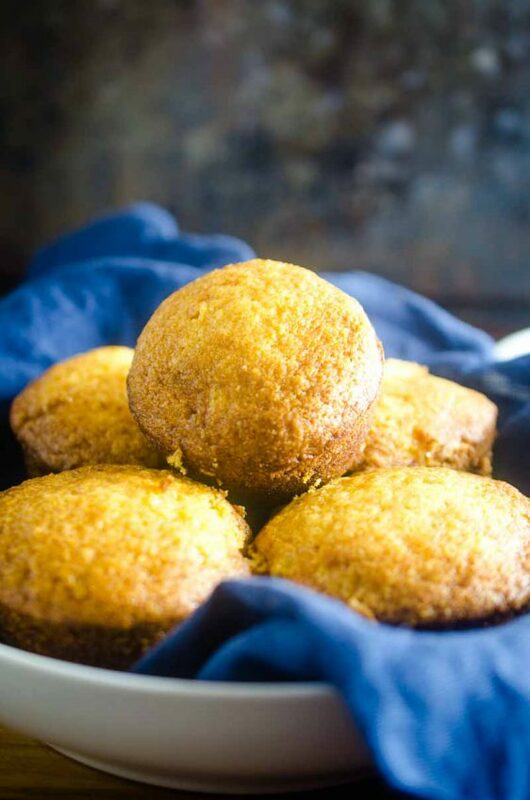 ;) … and these muffins look AMAZING. I have always loved Fleischmann’s yeasts, so I am SO excited to see that they have come out with baking mixes now! :) These muffins look delicious! Dear Des, my family would gobble these up too! 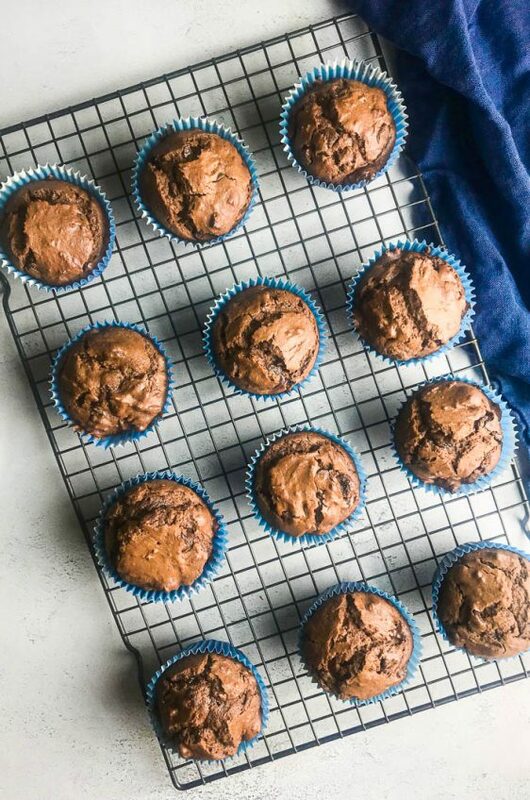 Chocolate chips are such a great combination with banana muffins. These new Fleischmann mixes look so convenient and delicious! I agree chocolate and banana is seriously the best! They are a great breakfast! I’m going to have to try this mix for sure! Breakfast needs to be easy in my house!! Easy breakfasts, especially on the weekdays are the best!